Surrey, BC - Tickets for Surrey Eagles home games for the second round of the Fred Page Cup Playoffs are now on sale. 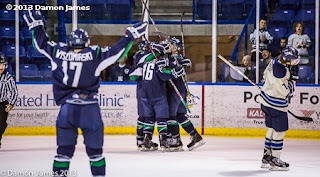 Surrey will face either the Chilliwack Chiefs or Prince George Spruce Kings in round two after the Birds beat the Langley Rivermen 3-1 in a best-of-five series in the first round. The Mainland Division Final is also a best-of-five with the winners of the two first round series facing each other for the right to advance to the Coastal Conference Final. The Eagles will host Game 1, Game 2, and Game 5 if necessary. Second round tickets are $15 for adults, $12 for students and seniors and $9 for children. Fans can purchase tickets to all three games. If there is no Game 5, tickets will be re-assigned to the next round or reimbursed. To purchase tickets, call the Eagles office at 604-531-GOAL (4625).